O "NRP Atlantida" Uma Vasco da Gama e o NRP Bérrio não deveriam estar a sair do Alfeite em direção a Moçambique?? E cabem lá 20.000 pessoas (comunidade portuguesa em Moçambique)? Maputo, 12 fev (Lusa) - As Forças Armadas de Defesa de Moçambique (FADM) confirmaram hoje ter lançado uma ofensiva contra posições da Renamo na Serra da Gorongosa, centro de Moçambique, justificando a ação com um "contra-ataque" a ações de homens armados do movimento. Os confrontos entre as FADM e os homens armados da Resistência Nacional Moçambicana (Renamo), no centro do país, conheceram nas últimas semanas um abrandamento, na sequência de avanços nas negociações entre o partido e o Governo em torno da lei eleitoral. Mas, no último fim de semana, a Renamo acusou o exército de empreender uma ofensiva contra posições do movimento na Serra da Gorongosa, imputando ao Governo a pretensão de matar o líder do partido, Afonso Dhlakama, que estará refugiado nas montanhas, desde que foi expulso do seu acampamento na região por uma ação das forças de defesa e segurança. Noticia que aparece no Economist com data de 9 de Agosto. Como os editores têm tendência a preocuparem-se principalmente com a economia ou as finanças, o caso deve parecer sério. RESIDENTS of Naunde village were woken by gunshots at around 2am on June 5th. Two of the attackers carried guns. The other three, armed with machetes, set houses on fire. Then they chased down a local chief and hacked off his head in front of horrified neighbours. They also killed six others, including an Islamic leader whom they beheaded in a mosque. 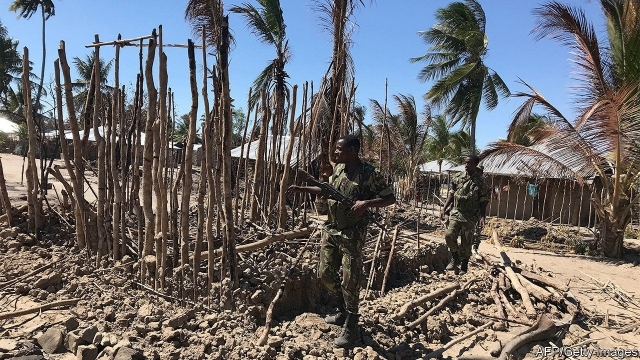 The attack, documented by Human Rights Watch, a pressure group, is one of several dozen carried out by jihadists in Cabo Delgado—a mostly Muslim, coastal province in Mozambique’s far north—since October 2017. Recently many have followed a similar pattern: hit-and-run raids during which attackers torch houses, steal supplies and behead victims. In May terrorists decapitated ten people, including children. Officials have tried to brush off the violence as mere banditry. But the attacks appear to be increasing. Who the killers are and what they want is not entirely clear. Uncertainty surrounds even their name. They are known as Ahl al-Sunnah wal-Jamaah (Arabic for “followers of the prophetic tradition”), though locals also refer to them as al-Shabab (“the youth”). They have no known ties to the jihadist group in Somalia, which is also called al-Shabab, but some researchers think the jihadists in Mozambique have received training abroad. Beyond touting a strict form of Islam, the group’s political agenda is rudimentary. According to Joseph Hanlon of the London School of Economics, Ahl al-Sunnah wal-Jamaah emerged when groups of street traders, united by economic frustration and radical Islam, came together in 2015. They urged people not to pay taxes or send their children to state schools—and they stormed into mosques, knives waving, to lambast local Islamic practices. For years locals complained about the growing number of angry young men in their midst. But Mozambique’s corrupt and listless authorities did little. The group’s first attack, last October, took officials in the capital, Maputo, by surprise. Cabo Delgado should be booming. Companies such as Anadarko and Eni are investing some $50bn (around four times Mozambique’s annual GDP) in the region to exploit gas reserves found in 2010. Gemfields, a British firm that makes gem-encrusted eggs, arrived in 2011 to mine what is said to be the world’s biggest ruby deposit. But locals say they have seen little benefit. Cabo Delgado still lags behind Mozambique’s more prosperous south. Many of the jobs created by the gas finds go to highly skilled expatriates, not to locals, who are mostly illiterate. Young people in Palma, a town at the centre of the gas projects, protested in May, claiming that their job applications are ignored. Ahl al-Sunnah wal-Jamaah is not expected to hamper the region’s gas projects. But what happens next may depend on the state’s reaction. So far it has beefed up security and arrested hundreds of suspected jihadists. Eric Morier-Genoud of Queens University Belfast compares Cabo Delgado to north-east Nigeria during the early days of Boko Haram. There a heavy-handed crackdown helped transform a radical religious sect into one of Africa’s deadliest terror groups. The hope is that northern Mozambique does not go the same way. Já se encontram na INTERNET notícias sobre estes problemas pelo menos desde o mês de Maio. pelo que o problema parece estar em evolução. On 7 December 2018, 30-year-old Mustafa Suale Machinga was captured by local residents and referred to authorities in Litingina village in Nangade district in Mozambique’s Cabo Delgado province. Machinga, a former member of the Mozambican armed forces was captured after being accused by residents of leading the group responsible for Islamist militant-inspired attacks in the province. According to Jane’s Terrorism and Insurgency Centre (JTIC), the 19 attacks recorded since 5 October 2017, which marked the eruption of an emerging Islamist insurgency within the province, have resulted in 57 non-militant fatalities. However, local sources have claimed that at least 283 people have been killed during attacks since October 2017. Comunidade islâmica de Moçambique critica ataques e denuncia "interesses"